Fibre-optic (or fiber-optic, if you're in the US) broadband is a type of super-fast broadband that's delivered by cables in the ground, unlike ADSL broadband that runs over copper telephone wires. Optical fibre cables are made of glass or plastic, both of which are materials that facilitate fast movement of data along their length. In traditional ADSL broadband, which is delivered along copper wires, speed is lost quickly over long distances, with the result that speeds vary depending on how far a house is from the exchange. With fibre-optic broadband, however, less speed is lost over long distances. This makes it a superior option for those looking for super-fast broadband. Fibre-optic broadband is much faster than ADSL broadband because the cables are made of glass or plastic which is much better and quicker at carrying data than traditional copper wires. But what speeds can you actually expect? Depending upon your provider and the type of connection you have, cable broadband can deliver average speeds topping out at 900Mbps in the UK — but this is only available on Hyperoptic, which is still quite limited. Realistically, you're looking at average speeds ranging from 35Mbps on lower-tier options, 66Mbps on mid-tier options and 104Mbps or faster with Virgin Media's higher-end options. Which providers offer fibre-optic broadband? As recently as 2010, Virgin Media was the only UK fibre optic broadband provider. With maximum speeds of 362Mbps, it's still one of the fastest services around. However, since then a host of competitors have come to market with rival products, including providers on the Openreach network. Average fibre speeds from these providers are around 35Mbps for the lower tier fibre packages and 66Mbps for the higher-end fibre option. Find out about BT Superfast and compare our best Superfast deals at uSwitch's BT Superfast page. To compare all Virgin Media's broadband packages see our dedicated Virgin Media provider page. Virgin Media has a range of fibre optic broadband offers to suit every need and, more importantly, every pocket. The sheer speed of Virgin Media's service means its offerings are many people's pick as the top fibre optic broadband deals around. Broadband and home phone deals: Virgin Media’s home phone and broadband offers combine super-fast fibre optic broadband with free weekend calls to UK landlines and cheap call rates. Broadband bundles: combine your broadband with home phone, digital TV and/or mobile phone packages to make great savings. Standalone broadband: Virgin Media's fibre-optic broadband gives customers outstanding value without asking them to commit to transferring other utilities too. So-called broadband only deals can be a great way of saving money if you don't need a landline. The fastest broadband speed on offer with a Virgin Media fibre-optic broadband deal is 362Mbps. If you're in a large town or city, there's a very, very good chance you'll be able to sign up for Virgin Media cable broadband. Check out deals on Virgin Media fibre optic broadband. The UK's oldest telecomms provider offers a fibre-optic broadband service. Cheaper BT fibre packages feature maximum average speeds of 50Mbps or 67Mbps. These use 'fibre-to-the-cabinet' technology rather than 'fibre-to-the-premises' technology. This means that BT fibre customers' broadband speeds can still be affected by the distance from their nearest exchange to their home, although not as much as with copper phone lines. 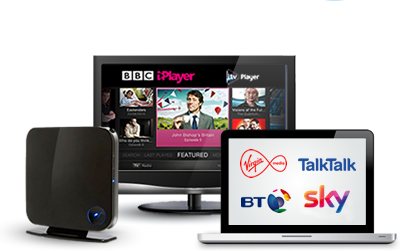 As with Virgin Media, BT fibre broadband can be combined in a broadband bundle with other services such as YouView on-demand TV and a home phone. In fact, BT's fibre broadband is only available to people with a BT landline, so you're going to need to bundle with a home phone service if you're considering signing up for it. Compare fibre-optic broadband deals on the BT Superfast fibre range. TalkTalk, EE and Plusnet all use BT's fibre-to-the-cabinet technology to deliver maximum average broadband speeds of 67Mbps. All three stand out for generous usage limits, offer free routers and are available in large towns and cities where BT has upgraded its network. Customers on standard ADSL broadband TalkTalk packages can upgrade to TalkTalk's fibre-optic service by adding a TalkTalk Fibre Optic Boost to their package for an additional monthly fee. Cable broadband is available to millions of UK households mostly in towns and cities. If you aren't sure whether you can access cable broadband at home, use our postcode checker to find out. If you're not in a Virgin Media cable area or you're in a part of the country where BT's pure fibre broadband service has yet to reach, you may still be able to get a super-fast fibre connection with BT's fibre-to-the-cabinet broadband service or from the providers detailed above who use BT's network infrastructure. Find out about BT Superfast and compare BT Superfast deals at our dedicated BT Superfast page. Compare all cable broadband packages here.